BEND, OR -- Bend Police are investigating more than 15 reports of counterfeit $20 bills being used at local businesses. The bills look identical, including the same serial number and markings. They have the words "COPY MONEY" written in the corner of one side and "SPECIMEN" printed in red on the other side. The money looks legitimate, but investigators say the paper feels different than real cash. The fake money was passed at Bend establishments like 7-11, Burger King, McDonalds, Taco bell and Bogey's Burgers. In some cases, employees noticed the counterfeit and contacted police; but in others, the money was reported by the bank who received it. Anyone with information in this case is asked to call law enforcement through non-emergency dispatch at 541-693-6911. 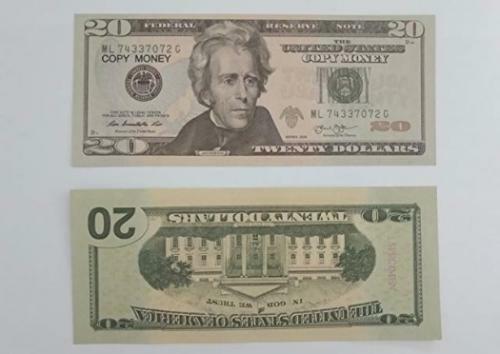 Photo: Submitted by Bend Police; the recovered counterfeit money have similar markings, but different serial numbers than what's shown above.